Plans for a £100m stadium in Bristol could be in jeopardy after a public funding gap for the project was revealed. A consortium of four builders has yet to start work on the 12,000-seater Bristol Arena. The South West Regional Development Agency said the project's success now depends on partners working together. It added that the funding gap was not a new discovery and had been factored in from the beginning of the scheme. "This project is a public-private partnership and there is always a funding gap: what is to be made up by the public sector, said a spokeswoman. "It is a long-term negotiation... The funding needed from the public sector has not been agreed on yet." But the agency said it could give no guarantees the public sector would pay if the amount was too great. The building firms involved are Orion Land and Leisure, SMG, housing developer Bellway PLC and construction firm Sir Robert McAlpine. Burland TM has already been appointed as masterplanner of the site, with HOK sport architecture chosen to design the building and facilities. A recent report from Orion Land and Leisure, which cost almost £500,000 and highlighted the gap, also covers the economic and environmental impact the arena will have on the city. The company declined to give exact details, but said that it has now reviewed the project and brought the funding gap down to an acceptable level. 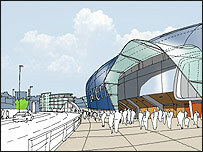 It was now looking for a positive answer from its partners for the Arena scheme to go-ahead, a statement read. Around £13m has already been spent purchasing and clearing a nine-ace site for the arena near Temple Meads railway station. Ian Thompson, from the South West RDA, added: "The arena is dependent on the public and private partners coming up with the right funding package. "Also the complexities of this project with regards to transport and planning and are not something we can just get on with straightaway," he added. Helen Holland, Labour leader of Bristol City Council, added: "One of the things we have done is to start looking at these issues. "We are keen on the Arena, but it is a complex project." The scheme is expected to cost between £100m and £150m and was expected to open in 2008.